There are more than 40,000 domain names registered under the new extensions delegated by ICANN (the Internet Corporation of Assigned Names and Numbers) within last months. 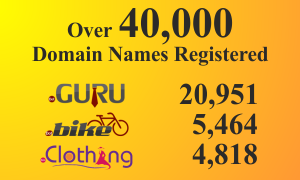 According to data published by DomainIncite.com on 8 February, among the newly released new gTLDs, the .GURU domain is leading the way with more than 20,000 domain names registered under the suffix. The dynamic daily growth rate of approximately 30-40% demonstrates genuine interest in the new namespaces with the exception of the Arabic IDN .SHABAKA, delegated in October 2013, that seems to be tailing off. Big businesses have already expressed interest in the new gTLDs. To date, big corporations including Amazon, Apple, General Electric, Microsoft and Maserati have registered domain names under new extensions.